Clark School Professor Bruce Jacob (electrical and computer engineering) pried open his new electric guitar and wondered why he couldn't get more sounds out of it. The first guitar he purchased since he was a teenager, the instrument's available tones were more limited than the guitars Jacob grew up playing. The engineer in him sought an answer. "I decided to catalog every cool sound a guitar could naturally make," says Jacob, a Keystone Professor and director of the Clark School's computer engineering program. "But the problem was, as every engineer knows, when you investigate how things work, you begin to realize what is possible." In 2006 Jacob launched Coil LLC to make his perfect guitar. He taught a guitar electronics course. Five students joined Coil: Justin Ahmanson and Tim Babich, now both alumni, now graduate student Joseph Gross and undergraduates Franklin DeHart and Christopher Monaghan, all from the department of electrical and computer engineering. Together they developed patent-pending electronics to give them all of the sounds they wanted from a guitar. Jacob then designed gorgeous guitars to put them into. An electric guitar's distinct sounds come from its pickups, magnets wrapped in copper wire that "pick up" the vibrations of a guitar's strings, convert them into electrical currents and send them to an amplifier, speaker or recording device. Guitarists can select different pickups through a switch on the instrument to produce different sounds. How those pickups are wired into the guitar--for instance, if they are wired to one another or not--also determines the sounds any one guitar can make. Jacob wanted every available option from his guitar's pickups. Rather than rewiring them, as many guitarists do, he connected each pickup to a circuit board in the back of the guitar. That circuit board is equipped with small jumpers or pegs that can be set into different slots to configure the pickups to almost any combination to produce various sounds. "Paul Reed Smith was one of the first guys to come up with a custom switch to give you all the permutations available," says Paul Schein, guitar guru for Chuck Levin's Washington Music Center. "What he [Jacob] has done is take it to the next level. Here is how you get these two coils in parallel, these in series. These are the five or so I want. That's a cool thing because it allows people to go in and configure the guitar." Each of Coil's pickup switches offers a different circuit board and switch configuration. The ToneflyTM E/P switch offers seven different sounds, with five available through a five-way switch when playing the guitar. The CustomWireTM model also uses a five-way switch, but can be customized to more than 50, wildly different tones. The Jacob's LadderTM model gives musicians 22 unique sounds, but combines a three-way switch with a five-way switch to make 15 of the 22 tones available at play time. For guitarists, this means they don't have to rewire a guitar to get the sounds they want. It also means they may need to carry fewer guitars with them to performances, since they can get more sounds out of one guitar. "Last night I dragged four guitars, including a Telecaster, a Gibson, and an old sixties model that does something a little different, to a recording session," says Ron Haney, a music producer and a guitarist for Alicia Keys who has also played with Bono, Gwen Stefani and Sheryl Crow. "Reducing that number by having a guitar that is more versatile would make life easier when going to gigs or to record." Jacob's next invention, called LevelHeadedTM, makes it easier to combine different pickup combinations. For instance, when guitarists switch from a crunchy humbucker sound to a clean, crisp, single coil, the volume drops, making it difficult to play live. LevelHeadedTM gives each switch setting its own volume, so single coils come out as loud as humbuckers. "We put the volume adjustment after the switch," says Jacob. "No one has done that before." If guitarists combine LevelHeadedTM with Coil's preamp (designed by Ahmanson and Babich), which amplifies sound before it leaves the guitar, the volume leveling is done by increasing the volume of the softer tones, rather than reducing the volume of louder ones. The Coil team next turned to the tone knob. "Most people don't use it," Jacob says. "It is a low-pass filter, cutting off high frequencies and sapping some of your signal. We were wondering how to make a tone knob that really changes the guitar's resonant frequency." Enter QtoneTM (one knob) and QfreqTM (two knob), tone controls that revive and enhance one of the most effective technologies that has ever appeared in electric guitars, according to Jacob: the passive parametric EQ filter, which allows you to change central frequency and filter bandwidth ("the Q"). Coil's tone knobs, developed by DeHart and Monaghan, can make a guitar sound rich and full, bright and chimey, nasal and funky, and everything in between. 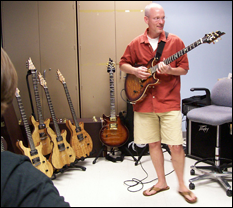 "There is this elusive term 'tone'," says Haney, who owns more than 30 guitars. "You are always exploring it and how far you can take it. You take one guitar, one amp, and one pedal and there is only so much you can do. With every new piece of equipment you get, the possibilities expand exponentially." Visit www.coil-guitars.com to see the company's guitars, videos of musicians playing them, and interactive demonstrations of how its electronics work.